Today’s post isn’t exactly a tutorial. I’ll just share the QVW I created and highlight some interesting features I think you can use to improve your own applications. Even if you’re not exactly the biggest Pokémon fan, be sure to check it out. I’m sure you’ll find something that strikes your attention! As usual, you can download all the materials here. 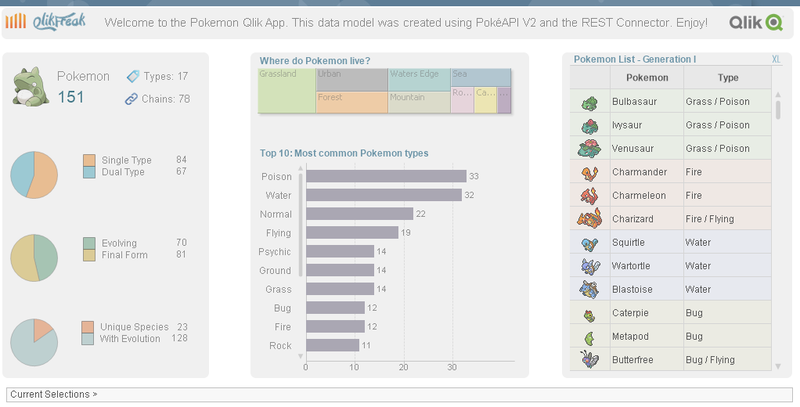 The first interesting thing about this app is that all the data comes from http://pokeapi.co/ using the Qlik REST Connector. At first I thought it was going to be difficult, but it’s as simple as creating an OLE DB connection. You just type in the address and the server will respond with a JSON structure that can be easily interpreted by the connector. After that, it’s QlikView as usual. 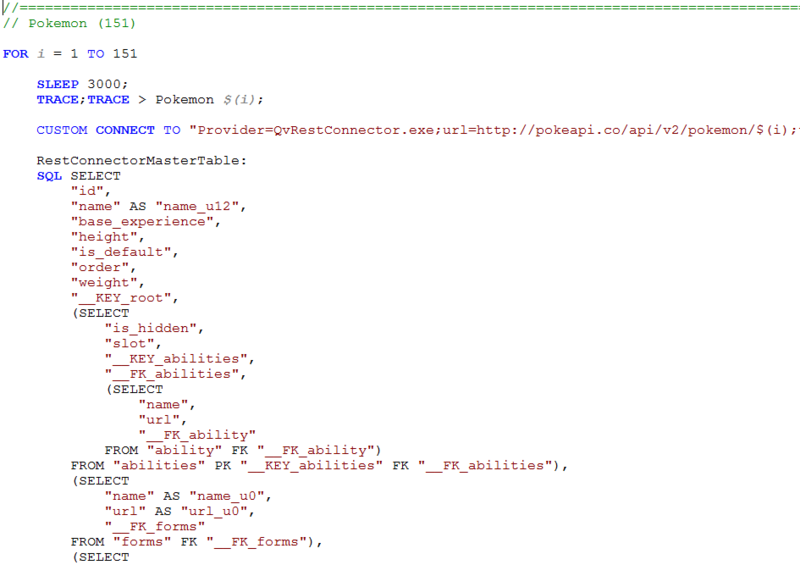 I only added some variables and a FOR cycle so I could read several tables (one for each Pokémon) without manually modifying the connection string. For more references, go to the QVD Generator included in the materials. 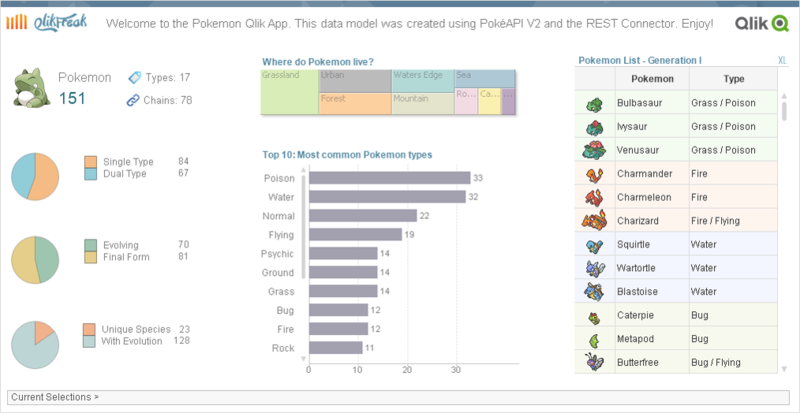 By the way, if you want to add extra tables to the data model, be sure to check PokeAPI in detail. They have a lot of information that you can retrieve in the same QVD Generator and make this app even better. Dashboard: This is the first step of our journey! 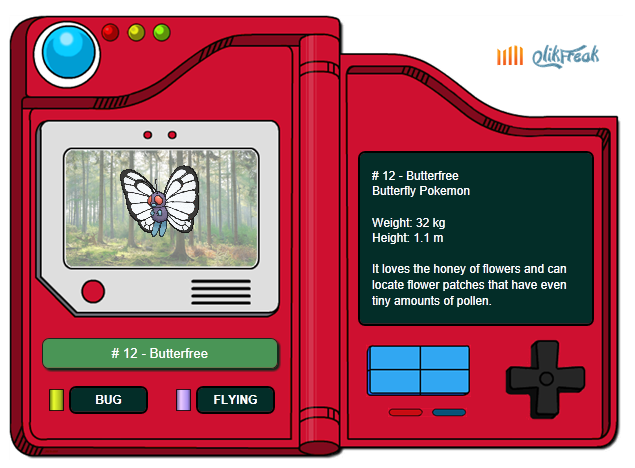 The opening tab displays general information about all the Pokémon in Gen 1 like the types, chains, forms and habitats. Pokémon: This one is one of my favorites. The second sheet gives you all the information you need about a Pokémon. 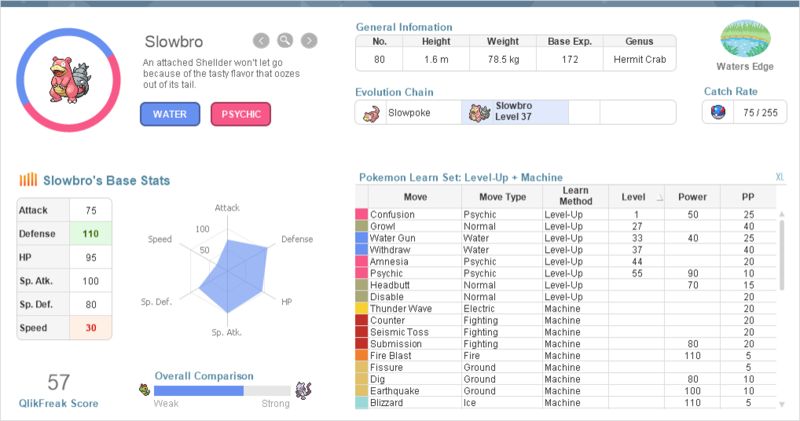 From its weight and height to all of its stats or even the moves it can learn. Use the arrows to navigate or just look for your favorite Pokémon with the search button. 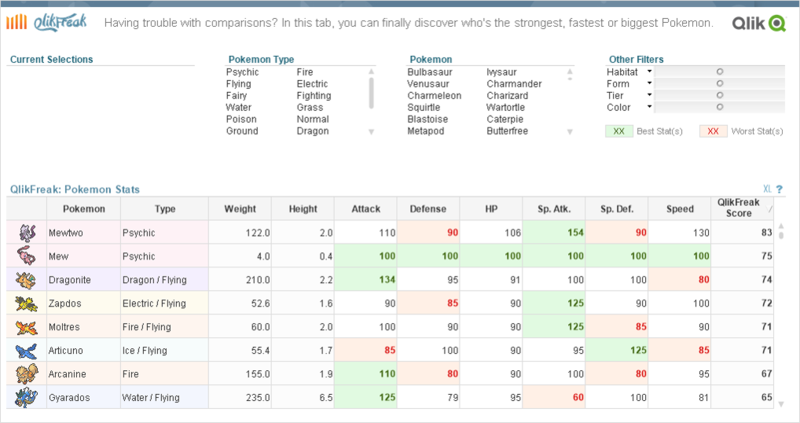 Stats: If you’re really trying to become the very best (like no one ever was), the Stats tab will help you recruit an appropriate team. 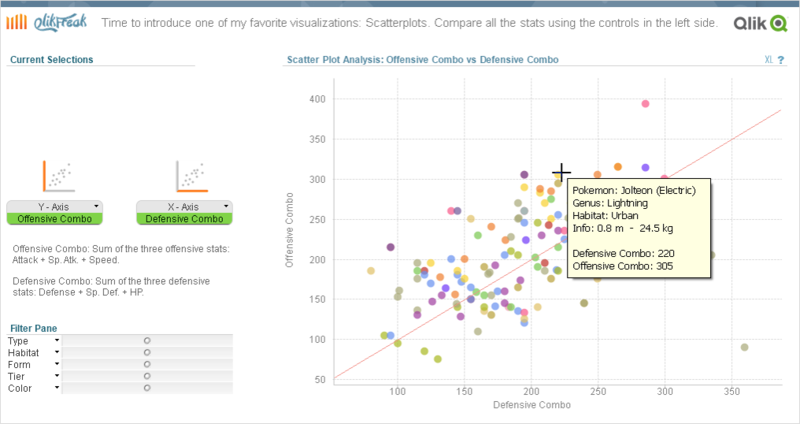 Scatter: You know me too well, no QlikFreak app is complete until it gets a scatterplot! Histogram: A simple, yet powerful visualization. If you’re not familiar with these charts, why don’t you take a look at this post? 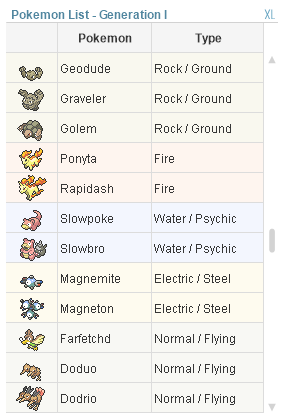 Moves: Now, now… Which Psychic moves with high power and accuracy can my Fire Pokémon learn? Wait, is that possible? Sometimes you don’t need to include list / multi boxes to let the user interact with your app. 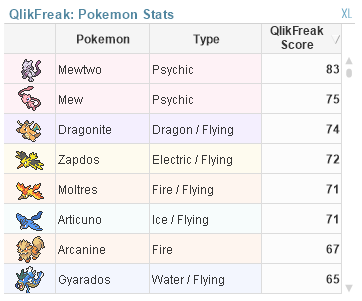 Our PokéDashboard is designed so that the user can click directly on the charts and tables to answer questions like “How many dual-type Pokémon are there in the forest?” or “Where do final-form, psychic Pokémon live?”. There’s nothing more uncomfortable as a QlikView user than working with charts that don’t have persistent colors. 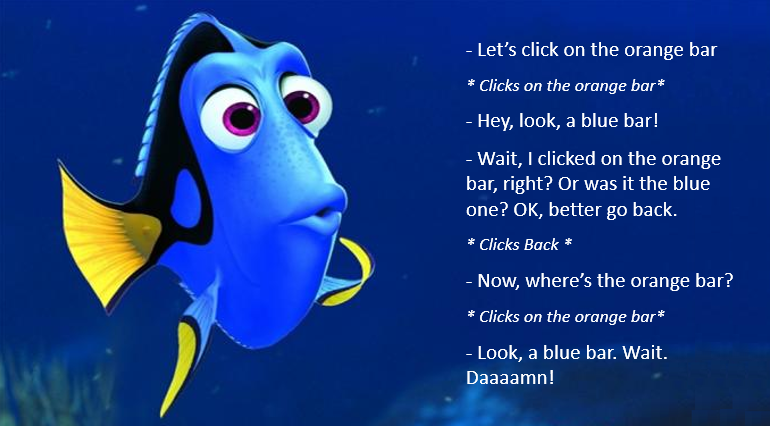 I hate that “Dory” effect. When you build a multicolored chart (specially area-based objects such as pies or block charts), it’s a good idea to go to the Colors tab and check the Persistent Colors box. With this, the brown area will remain brown and the green one will remain green despite of the selections you make. You know, the classic wireframe. Time filters on top, other filters on the left hand side and the charts in the middle. I don’t know why, but almost every demo and every real-world app I’ve seen has this distribution. Don’t be afraid of changing the standards. Create a KPI belt in the bottom. Use a three-column wireframe. Build an extra-wide table. Go nuts and include a goddamn Pokédex in the middle of the sheet. Sometimes you’ll end up with trash, but some others you get a fresh looking design that stuns the end-users. Always help the user spot the important things. Whether you’re working with a table, a list box or a chart, you can use colors, styles and other visual cues to remind your colleagues to look at certain elements. Associating colors with ideas is usually a good thing, especially when the color code has been established beforehand. 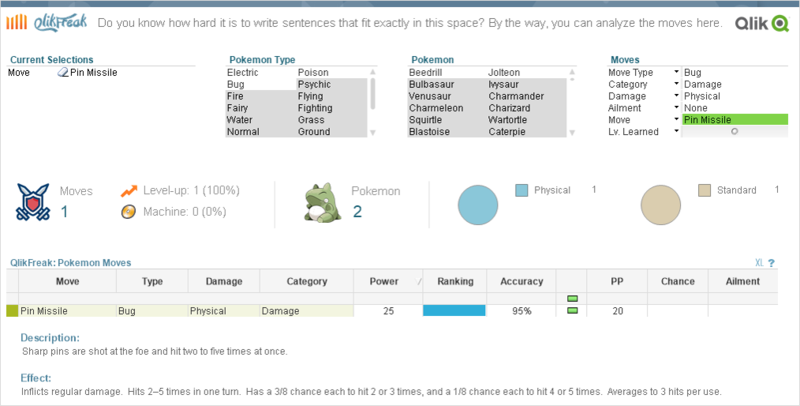 In our application, there’s a clear pattern in colors based on the Pokémon’s type. As you can see throughout the document, electric Pokémon are always yellow, poison types are purple and blue is restricted to water inhabitants. 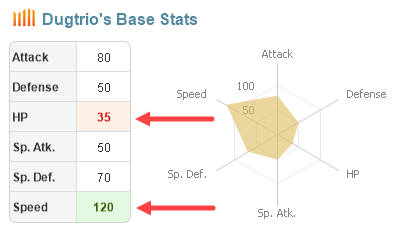 This encoding is persistent in tables (background), charts (bubble color) and even as a color mosaic for the moves. If you want to create an easy-to-navigate dashboard, you cannot forget about consistency. Using standardized fonts, color palettes and -above all- aligning and distributing all the objects on the sheet, makes you applications look more elegant and professional. The design toolbar offers useful options in this regard, so there is no excuse for not having a tidy dashboard. Did someone say chart junk? One of my favorite things about Straight Tables is their Interactive Sort functionality. Do you need to find the strongest Normal Pokémon? Check. Who’s the fastest beast in the Grasslands? Check. 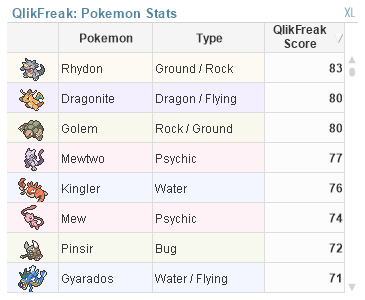 Out of the 10 largest Pokémon, who has the lowest Defense. Check. Life’s so easy when you can sort stuff out. Note: If you’re not familiar with the classic Pokémon games you might want to skip this section (really). First, I created a Box Plot to check if all the stats had the same scales and distributions. Why? 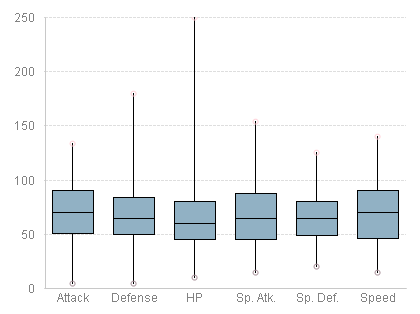 Well, from my experience in the games, a variance of 10 points in HP is not as relevant as 10 points in Attack, so I thought that taking a closer look at all the ranges would be interesting. As you can see, some of the stats have wide ranges (HP: from 10 to 250 points) and some others are considerably smaller (Sp. Def: from 20 to 125 points). Therefore, I decided to normalize all the scales so they could be comparable by using a Min-Max formula. 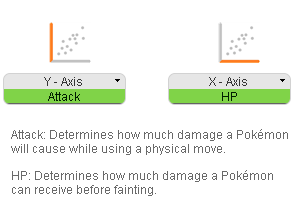 Using this visualization, we can easily conclude that the average Pokémon has around 60 or 65 Hit Points (highest part of the curve). 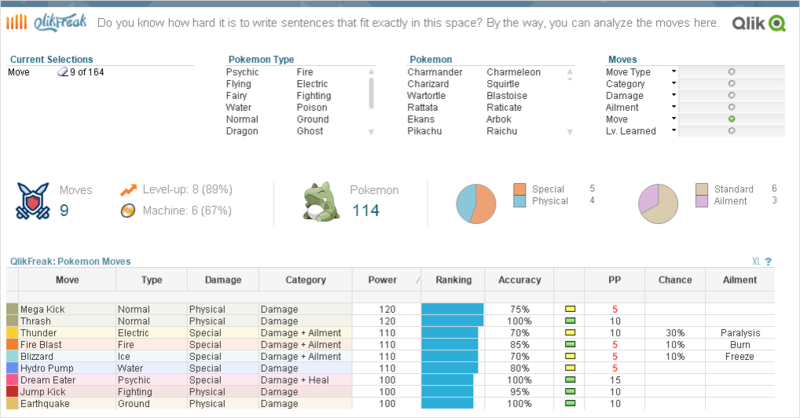 However, there’s a small bar far in the right with an insane score of 250 points: Chansey. If I used this number (which is much higher than any other element) for the Min-Max Normalization, I would “punish” the rest of the observations leaving them with a very low grade. My solution (which has no solid statistical foundations) was to “cut off the tip of the tails”. In other words, I didn’t use the actual minimum and maximum values. Instead, I used the fractile() function to get rid of the first and last 2% so the outliers wouldn’t affect the scores (Sorry Chansey, I know HP was your only good stat). 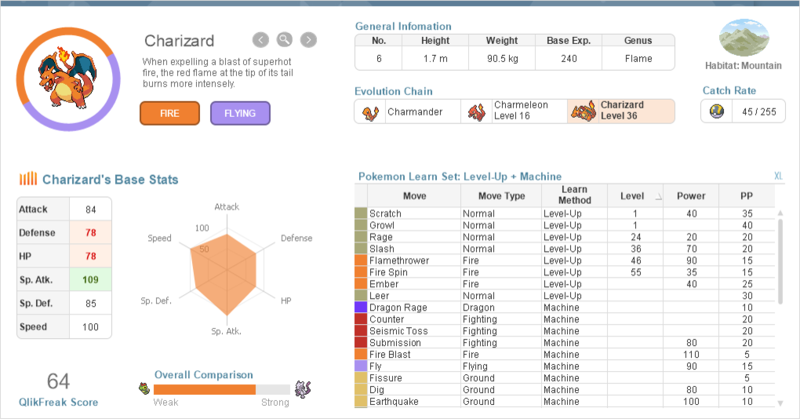 These normalized scores give you a more realistic view of each Pokémon’s abilities. 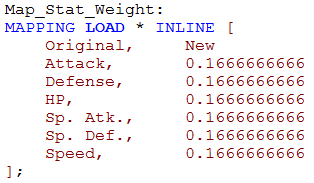 However, I wanted to include my personal preferences into this calculation as well, so instead of a simple average or sum, I decided to give each stat a weight. 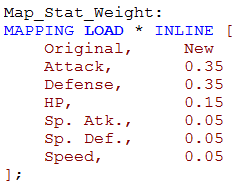 If you want to give it a go, just open the script, change the Map_Stat_Weight table in the Stats tab and reload the document! If you liked this post, be sure to share it with your friends and colleagues. Don’t forget to follow me on Twitter (@QlikFreak). Until next time! PD. I promise my next post will be serious QlikView stuff again. Well… maybe. I love that you use Qlik for fun. I tried a Pokemon app a few years ago with my kids manually entering their cards into a spreadsheet, but that didn’t go so well for obvious reasons! Keep up the good work. This is great! A fun way to see the possibilities of Qlik. Excellent example of the Power of Qlik!! Thanks for sharing! This is awesome!! This is amazing!!! Congratulations man! This is genius! Very well done to you sir! Wow! I can’t believe you crammed so much great stuff into one post! This is amazing. Thanks for sharing it. Where do I download this app? Wow, fantastic post and amazing app! Should we expect a Qlik Sense app in the future?